Caroline Phillips deploys minimal forms, handmade processes of making, and the intensity of repetition to explore contemporary feminist aesthetics. Her spatial installations and sculptures reconfigure relationships of power, sexual politics and embodied experience to (re)present the relational art object as a feminist object. Her most recent solo show Materialising Feminism at Margaret Lawrence Gallery, Melbourne (2016) examined the minimalist object as a feminist, relational device. Her new body of work underdevelopment at NARS will revisit ‘central core imagery’ through abstraction as a critical metaphor for feminist practice. Caroline Phillips is a Melbourne based visual artist whose work has been shown in a number of solo and group exhibitions in Australia and Internationally. Solo exhibitions includeGeorge Paton Gallery, Melbourne, Blindside, Melbourne, Margaret Lawrence Gallery, Melbourne, Factory 49, Sydney, Craft, Melbourne and the Cité International des Arts, Paris. Selected group exhibition venues include: Slade School of Art Research Centre, London; The Substation, Melbourne; The Great Hall, OCAD University, Toronto; M16, Canberra; West Space, Melbourne; Artscape Gibraltar Point, Toronto; Australian Tapestry Workshop, Melbourne; Ararat Regional Art Gallery, Victoria and First Draft Gallery, Sydney. She holds a PhD (Fine Art) from Victorian College of the Arts, University of Melbourne (2017), a Master of Fine Arts (2012) and a Postgraduate Diploma in Visual Art (2009), also from the Victorian College of the Arts, and a Bachelor of Fine Art (Painting) from Phillip Institute of Technology, Melbourne (1983). Phillips also works as an independent curator and researcher. 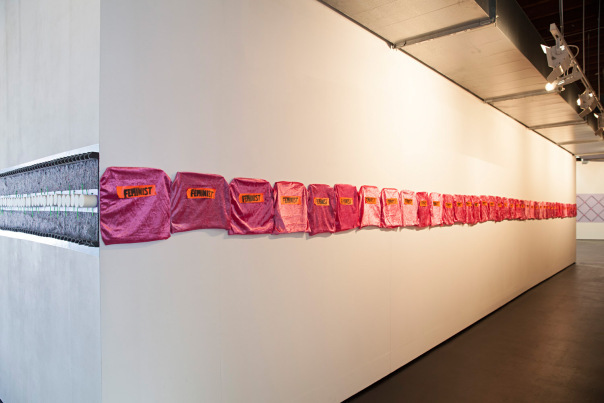 Her most recent collaborative curatorial project f generation: feminism, art, progressions (2015) explored connections amongst the work of 96 contemporary feminist artists at George Paton Gallery, Melbourne. From 2016-18 Phillips is Research Assistant for Prof Anne Marsh, working on the Women, Feminism and Art in Australia since 1970 Australian Research Council project at the Victorian College of the Arts, University of Melbourne.